The Evangelical Fellowship of India (EFI) has described 2017 as “one of the most traumatic” years for Indian Christians in a decade after it recorded 351 verified incidences of hate crimes against Christians during the year. The Religious Liberty Commission of the EFI, which brings together Christians from more than 50 Protestant denominations, said the government needed to restore Christians’ trust in its ability to protect them. The report, which was published on 16 February, said the commission had said that non-Hindu communities were being targeted “with impunity” and urged the Indian government to punish those who were “spreading hatred” against them. The report’s authors drew parallels with the scale of violence experienced last year and what they termed the “pogrom” that took place in Kandhamal in 2008, when nearly 100 Christians were killed, 6,000 Christian houses and 300 churches were plundered, leaving 56,000 Christians homeless. The number of recorded hate crimes against Christians in India shows a rise in recent years from 147 in 2014, to 177 in 2015, to 134 in the first six months of 2016. The new report listed four murders, 110 incidences of “physical violence/arrest”, 70 of “threats and harassment”, 64 occasions when worship was forcibly stopped, and 49 cases of Christians being falsely accused and arrested. The report noted that India’s Hindu-nationalist government had acknowledged in Parliament that “communal violence”, the term used to define clashes between religious groups, “increased 28 per cent over three years to 2017”. EFI’s general secretary, Rev. Vijayesh Lal, told World Watch Monitor today (19 February) the situation for Indian Christians “is deteriorating pretty rapidly”. He suggested that the rise in anti-Christian violence was eroding Christians’ trust in their government. “The confidence of the community in the government needs to be restored. We are presenting this report to the government to take necessary corrective action,” Rev. Lal said. “I am afraid the worst will unfold in 2019,” Rev. 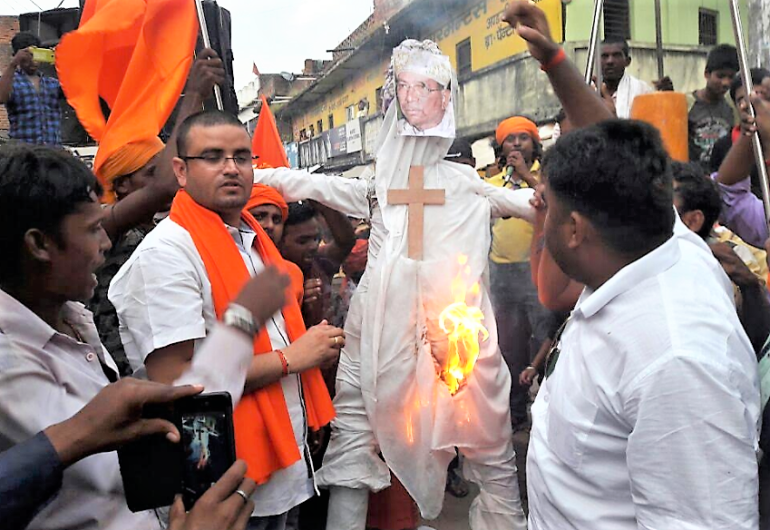 Lal added, suggesting that there could be an escalation in anti-Christian violence around next spring’s elections, to stigmatise Christians as threat to “Hindu India”. The report suggests the violence is focused on Sunday worship and Lent and Christmas. Many incidents targeted church services and 54 cases were recorded in April, and 40 in December, both above the monthly average of 29. “It is distressing to see even private worship being attacked by Hindu right-wing activists violating the privacy and sanctity of an individual or a family and trampling upon their constitutional rights,” the report noted. It also recorded new ways in which Christians were targeted. “Christian children going to attend Bible camps with their parents’ permission, being taken into custody [by police] and detained for days on suspicion of conversion is bizarre and unheard of,” the report noted. Except for the southern state of Tamil Nadu, which reported the highest number incidents (52), most of the other incidents reported took place in central Indian states ruled by the BJP – Prime Minister Narendra Modi’s party, which is known for pursuing a Hindu-nationalist agenda. The violence in Tamil Nadu, the report noted, has “a disturbing overlay of caste discrimination”. Victims generally come from the so-called “lower castes” in villages where the dominant groups object to prayer houses and even the entry of missionaries, it added. In the states run by the BJP, which include Uttar Pradesh, Chhattisgarh, Maharashtra and Madhya Pradesh, the reported said “the Sangh [Hindu nationalist] cadres have free hand, with the police and administration either looking the other way, or complicit”. The report claimed that the criminal justice system at the village- and small towns-level “routinely ignores or violates provisions in the law” and said constitutional provisions for religious freedom, right to life and freedom needed to be “available to the poorest person in the most remote village”. While focusing on the targeting of Christians, the report said the commission is “alive to the persecution of, and pressure on, other religious minorities, caste discrimination against Dalits, and the situation of women”. The report accused some state governments and their heads of using public money “to denounce Christianity publicly”. It warned that the political environment had begun “heating up” ahead of general elections in spring 2019. “Foot soldiers of the BJP … have shifted into high gear in hate campaigns and targeted violence against individuals and groups, mainly religious minorities and Dalits,” it added. Statistics revealed in India’s parliament on 6 February confirmed a long-standing allegation by rights groups that religious-based violence is growing under the premiership of Narendra Modi. The figures contradict the assertion by Alphons Kannanthanam, a member of the BJP and the first Indian Christian in Prime Minister Narendra Modi’s cabinet, who said: “There has not been even one instance when a church was burnt or Christians attacked anywhere in the country after Modi came to power,” Kannanthanam said.